Few, if any, normal bands could survive what Yellowcard has survived - two years on the shelf, no label backing, and some roster shuffling – let alone emerge from the darkness on the other side unscathed. Well, then Yellowcard is not a normal band, because not only have they surfaced from the abyss unscathed, but their latest studio effort When You’re Through Thinking, Say Yes is proof positive that they are thriving. No, this is not a pretty reunion, or a one-time off affair just to make some quick cash. This is real, and When You’re Through Thinking, Say Yes shows that Yellowcard is indeed back, alive and well, sounding now perhaps as good as, or even better than, they ever have as a cohesive unit. 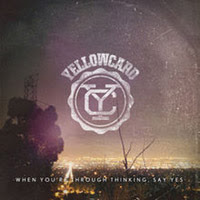 When You’re Through Thinking, Say Yes is in fact the record that Yellowcard fans have been crying out for since just after the turn of the century. This collection of powerpop gems is the best the band have sounded since 2003’s landmark Ocean Avenue and sounds as if it should have been the logical follow-up to that album eight long years ago. It is more Ocean Avenue than Paper Walls, and if you forgot the band released Lights and Sounds in 2006, there’s a good chance you’re not alone. There’s an argument to be made that the ballads of When You’re Through Thinking, Say Yes lack a bit of punch, tending more to sit back on their emotional laurels, coming across a bit too bleeding heart for their own good (“Hang You Up,” “Sing For Me”), though the crunchy fever pitch of the albums more driving moments more than make up for any shortcoming of the albums slower instances (“The Sound of You and Me,” “For You and Your Denial”). This time around singer Ryan Key does what he does best in delivering both a memorable and powerful, pitch perfect vocal performance amidst the gale force drumming of Longineu Parsons, steady rhythm contributions from Ryan Mendez and Sean O’Donnell and the (thankfully) ramped up workload of violinist Sean Mackin. The best part of When You’re Through Thinking, Say Yes may just be the simple fact that it sounds fresh and finds Yellowcard ultimately rejuvenated, and not trying to be something they no longer are. This album isn’t just a rehashing of things the band has done or a retelling of places the band has been, and for that, welcome back Yellowcard.